Atlantic recording group Simple Plan has announced details of their long awaited new single. “Saturday” – the multi-platinum band’s first new music in almost four years – is available now in the iTunes Store and DSPs worldwide, and can be heard below. Produced by two-time GRAMMY nominee Howard Benson, “Saturday” heralds Simple Plan’s hugely anticipated new album, set for worldwide release later this year with further details to be announced soon. “We are extremely excited to finally release a new song for our fans! After spending the last two years writing and recording, we cannot wait for them to hear the entire album new album and to start playing shows everywhere!” says Simple Plan’s Pierre Bouvier. Following the release of “Saturday,” the band will celebrate by hitting the road with a wide-ranging summer tour schedule highlighted by a series of top-billed dates on the 2015 Vans Warped Tour beginning July 19th at Holmdel, NJ’s PNC Bank Arts Center. From there, the band crosses the Atlantic for select headline dates and appearances at such legendary European festivals as England’s Reading/Leeds Festival. As if that weren’t enough, Simple Plan will be among the stars performing at the second annual Journeys Alternative Press Music Awards, fueled by Monster Energy Drink, set for July 22nd at Cleveland, OH’s Quicken Loans Arena. For complete details and ticket information, please visit www.simpleplan.com/tour. 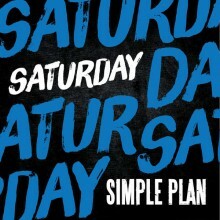 “Saturday” marks Simple Plan’s first new music since 2011’s internationally successful Get Your Heart On! Produced by Brian Howes, the album found the ever-inventive combo joined by an array of like-minded artists, including All Time Low’s Alex Gaskarth, Weezer’s Rivers Cuomo, and UK songstress Natasha Bedingfield. “Jet Lag,” the collection’s lead single, was an immediate worldwide smash, earning chart success and commercial milestones including 2x platinum certification from Australia’s ARIA. “Summer Paradise” – the album’s next single, released in two distinct versions featuring Somali/Canadian rapper K’Naan and GRAMMY Award-winning dancehall superstar Sean Paul – proved even more successful, ascending to the top 10 in Australia, Austria, Canada, Germany, Israel, the Netherlands, Norway, Poland, Scotland, Slovakia, Sweden, and Venezuela and earning gold, platinum, and multi-platinum sales in Australia, Austria, Canada, Denmark, Germany, Italy, and Switzerland. 2008’s Simple Plan proved an international blockbuster upon its release, reaching the #1 spot on the iTunes Store’s “Top Pop Albums” chart while also scoring top 3 successes in Mexico, Brazil, Japan, and the band’s native Canada. Furthermore, the album premiered in the top 10 in such far-away lands as Hong Kong, Sweden, Austria, Switzerland, Australia, and Germany, with top 20 debuts in Spain, Finland, and France. Simple Plan- Get Your Heart On!